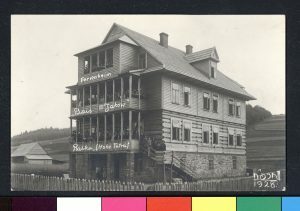 A postcard sent from the Bais Yaakov vacation home in Rabka, the Tatra mountains, 1928. Courtesy of the Joint Distribution Committee Photograph Archive, NY_01585. ‘The fourth professionalization course of Bais Yaakov began at the end of June and will conclude, God willing, at the end of September. Participants include teachers-in-training from the Kraków seminary, the teacher training course in Warsaw, and more advanced teachers from Poland and Austria, totalling 124 people. In the name of all these participants, we send our friends and supporters warm greetings and best wishes on the upcoming Jewish holidays’. 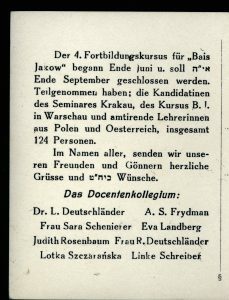 The card is signed by ‘The teaching faculty: Dr L. Deutschländer, A.S. Frydman, Frau Sara Schenirer, Eva Landberg, Judith Rosenbaum, Frau R. Deutschländer, Lotka Szczarańska, Linke Schreiber’. Associated Locations: Rabka, Tatra mountains. Document's Current Location: Joint Distribution Committee Photograph Archive, NY_01585.